Could Sanders have beaten Donald Trump? Would Bernie Sanders, the 74-year-old Jewish socialist from Vermont, have beaten Donald Trump? The answer, of course, is we don’t know. The mix of personalities, policies and circumstances would have been different. But Sanders did consistently beat Trump in hypothetical head-to-head matchups, according to the RealClearPolitics average. And he aimed to appeal to the one key group that delivered the election to Trump: white, working-class voters. Trump slaughtered Clinton in that demographic. Among white voters without a college degree, Trump won 67-28 percent, a 39-point margin that ABC News reported was larger than Ronald Reagan’s 32-percent advantage in his 1984 victory over Walter Mondale. No matter that Clinton won the minority vote; white, blue-collar Americans gave key Midwestern states to Trump, winning him the election. Several of those same states — Indiana, Michigan, Wisconsin, West Virginia — went to Sanders in the primary (though statistical evidence that he carried white blue-collar voters in the primary is scant). Like Trump, Sanders railed against the same free-trade deals that Clinton supported. He talked about saving factory jobs. Trump’s needling of Clinton on her support for NAFTA and TPP, arguably his best moment in the first debate, would have been deflated if he were arguing against a candidate who also opposed those free-trade agreements. And Sanders’ personal story could have lent credibility to his claims of standing up for working people. Trump accused Clinton, with a net worth of more than $100 million, of being part of an out-of-touch elite. Sanders, on the other hand, used to cook by dousing a roll of toilet paper in lighter fluid and igniting it in an empty coffee can. But could Sanders have appealed to independents? Trump, who specialized in nicknames like Crooked Hillary, could have had a field day with a man who essentially was the Republican caricature of Democrats: a Jewish hippie socialist from New England. Last year, half of Americans told Gallup they wouldn’t vote for a socialist, the worst result among a variety of identities. Clinton tried unsuccessfully to make the election a referendum on Trump. But facing Sanders, Trump could have made himself out to be the moderate facing a fringe extremist. Could a socialist have beaten an arch-capitalist in America? Writing about this question in The Week, Peter Weber noted that Clinton did score points by impugning Trump’s character on his treatment of women and attacks on minorities. 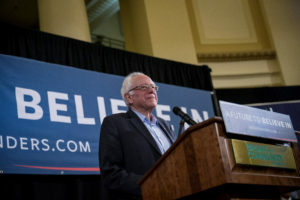 Sanders pledged to focus on policy, not personality. Finally, there’s the Jewish angle: Currents of anti-Semitism surrounded Trump’s campaign, from an endorsement by the Ku Klux Klan to abuse of journalists, many of them Jewish, on Twitter by self-proclaimed Trump supporters. But while the Jewish media paid attention to this issue, it didn’t receive a ton of play in the general campaign — even when Trump’s closing ad echoed anti-Semitic themes. Were his opponent Jewish, it may have been harder for Trump to dismiss allegations that he or his supporters trafficked in anti-Semitism. (Trump’s campaign vehemently denied that the candidate was responsible for, or was obligated to disavow, the anti-Semitism heard among some of his supporters.) His closing ad positing a global conspiracy flipped between pictures of Clinton and leading Jewish financial players George Soros, Janet Yellen and Lloyd Blankfein, all Jews. What if, instead of alternating with Clinton’s image, they alternated with a photo of yet another Jewish person?